As Glenwood Landing resident Tom Cerna explains it, the idea came to him as he was preparing to go on a week-long vacation to Montauk with his family this past summer and needed someone to water the plants. "The light bulb went off," he said. "It led to the thinking that it would be a great service to have a site that allowed for the posting of odd-jobs for local area kids to apply for. My wife and I felt that the site could be used for various odd-job applications such as raking leaves, garden and garage cleanup, garden maintenance, caring for pets, child car, moving furniture," as well as "a great source to locate local students for tutoring purposes, computer assistance, and home entertainment set up." "Anything that could qualify as an odd-job requiring minimal experience could be posted on the site." he explained. Mr. Cerna, a former stockbroker and securities principal, launched Youthire.com this past January, and describes the site as a "marketplace where local homeowners can outsource small odd-jobs to local area young adults aged 16-26." Using the service is quite simple. Those who need to have work done, can register at Youthire.com for free, and then, with minimal effort and computer knowledge, post a job. The post then goes "live" on a job search list that all registered Youthire Job Seekers can view from their computers or hand held devices and, if interested, apply. The Job Provider is notified of all applicants, and able to view their profile pages that list skills, interests, hobbies, school achievements and activities. The provider can then choose to assign the job to a particular applicant. All payments are made on-line by virtue of credit card, and the Youthire will receive payment within 3-5 business days after completing the job. Registering as a Job Seeker is also relatively simple. The Youthire needs only to create a profile page, indicate the categories of jobs in which he is interested, and set up either a paypal account if under under 18 years of age, or if older, a POPMONEY.com account (a service provided by Citibank). Mr. Cerna describes the site as a "win-win" for both homeowners and local youth. "Homeowners will have someone to handle the tough odd-jobs that take away free time, while the young adult will be able to incorporate a working regimen into their lives that allows them the freedom to work when they want and to choose the jobs that they want to perform." The service, he continued,will "liberate the young adult" as it allows her or him to "be their own boss," and will "also teach them the values of job satisfaction, work responsibility and an appreciation for the work ethic. It will help them to become self-reliant and confident in skills that they didn't even know they had." Although the site is only in its infancy, Mr. Cerna said that upgrades are already in the works. There will soon be a mobile app that will allow for instantaneous updates to job postings that fit certain categories for which the Job Seeker has indicated an interest. The purpose, he said, is to allow homeowners to get help quickly for "on the spot" jobs such as snow removal. Additionally, a page for use by small business owners seeking help will be created. However, unlike the service provided to homeowners, a payment of a small fee will be required - but waived during a 30-day trial period. 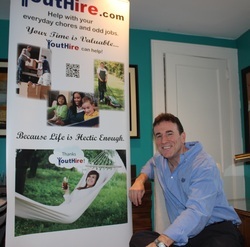 Mr. Cerna, said that after "beta-testing" Youthire.com in the surrounding areas of Sea Cliff, Glen Head, Glenwood Landing, Brookville, Glen Cove and Roslyn Harbor, he plans to branch out to all regions of Long Island and further.